The evening is a time for refreshment, leaving all tensions and making our mind and body equally relaxed with a nice cup of tea. In India, most of the people will have evening snack to savor with a nice cup of coffee or tea. In Kerala, we can see many small roadside shops with popular tea time snacks like parippuvada, pazhampori, cakes, sujiyan, ullivada, and so on. Majority of muslims in kerala, mainly malabar region is very good at making snacks for their family and relatives. 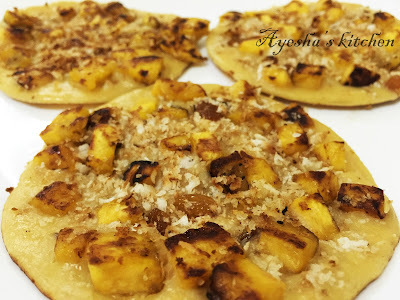 During ramadan, they used to prepare special snacks like unnakaya, kaayada, chattipathiri, pizza, banana cutlets and so on..This is an easy but a bit variety snack with banana, bread and coconut. So enjoying having this on special occasions. Heat a non-stick pan and add little ghee. Roast the finely chopped banana and the nuts till golden. Keep it aside. Now add the grated coconut to this same pan along with 1 tsp of sugar and saute it until crispy. Keep it aside. Now in a blender mix egg, bread, a pinch salt and 2 tsp of sugar. Blend them to a thick paste. If the thickness is less, can add more bread pieces. 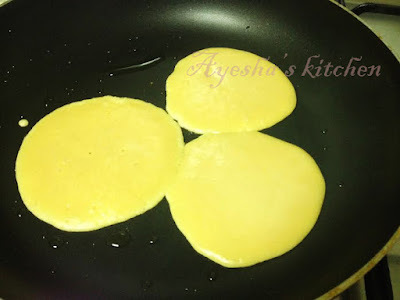 The batter should be thicker than rice dosa batter. Again heat the pan and spread some ghee evenly. When hot pour small kutti dosas ( u can pour two dosas at a time in a medium-sized pan, but it is better to pour one at a time). Sprinkle some dry roasted coconut, roasted bananas and nuts immediately once the batter is poured. Gently give a press to the toppings with the spatula. Cook in a low flame and then slowly flip the other side and cook for few minutes. 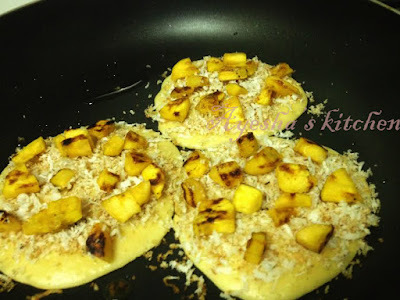 Again flip the other side and garnish with some roasted coconut sprinkles or chocolate sauce or honey.